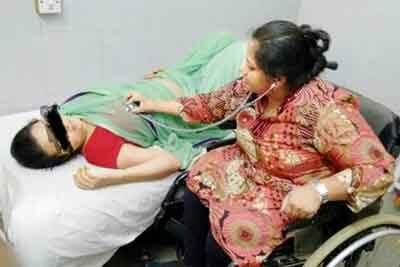 Mumbai: A wheelchair-bound paralysed woman doctor has received Maharashtra Chief Minister Devendra Fadnavis’ assurance for her transfer to her hometown. Dr Vaidya, in her petition through change.org, stated that she is 90 per cent disabled after she had met with an accident six years ago in which lower part of her body was paralysed. “I am 90% disabled and they expect me to travel 100 km everyday! I am a doctor and a single mother and I am trying to make an honest living… Six years back, my life changed upside down after an accident left me paralysed waist below,” she said. She said since she is completely dependent on others from getting up from bed, to get into wheelchair or even while going to bathroom, found difficult while working in Baramati without her family. Citing government rule that a physically-challenged person is not supposed to be posted further than 10 km from their home, Dr Vaidya petitioned the chief minister, appealing to get her transferred to her hometown in Pune. The petition received instant support on social media, getting signed by 85,000 people. Moreover, it also garnered an instant reaction from CM Fadnavis on twitter. The doctor has openly thanked the CM for his support. “I can’t thank the Chief Minister enough. His response will completely change my life. I won’t need to travel 100 km every day and I will be able to raise my daughter and also do my duties as a doctor with equal commitment,” Dr Alaknanda Vaidya said. After knowing that Chief minister has reacted over her online petition at Change.Org, she also thanked those who signed her online petition in support. “My daughter is overjoyed. I am going back to Pune. Thank you so much! Without your support this would not have been possible,” she said.